VPN 360 is a very popular VPN app created by Infinity Software. Its developers claim that the VPN product offers a strong level of protection on high-speed servers that enable users to mask their identities and access blocked content. We have taken a close look at and tested out the premium version of their VPN so that you don’t have to—carry on reading to hear our verdict. VPN Speed and Performance: Slow, medium, fast? As you can see above, VPN 360 provides an indication of how slow or fast the servers are. Personally, we don’t think “Slow,” “Medium,” and “Fast” tell you enough, so we carried out our own speed tests using the app made by speedtest.net. And these were our download and upload speeds when not connected to VPN 360… pretty quick! Our download speeds were reduced to 72.8Mbps when connected to the U.S. and 51.9Mbps when connected to Germany. While these are quite a big fall from 170Mbps, they’re by no means bad results. We expect a slight drop using VPNs, and 73Mbps is still decent. VPN 360’s interface is modern, simple to use, and responsive. A lot of effort has gone into designing an app that doesn’t only look nice but works well, too. We have no complaints so far as VPN 360’s interface goes. As you can see, connecting to a server is simply a case of pressing the big on/off button. 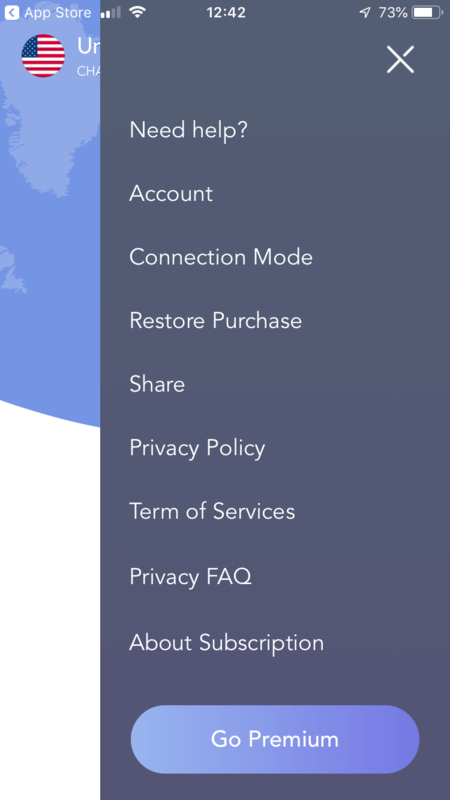 Pressing the hamburger menu in the top-right opens up a simple menu that you can use to get help, manage your account, and change your connection mode. 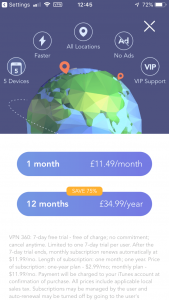 On a month-to-month rolling subscription, VPN 360’s pricing is pretty similar to leading desktop VPN services such as ExpressVPN and NordVPN, and these brands both include smartphone apps as part of your subscription. So, the monthly subscription will set you back $11.99. Considering this is only a mobile app, it’s definitely steep. However, this falls to $34.99 for an entire year (around $2.90 per month) billed as one payment. This is pretty cheap and is a fair price for the type of product VPN 360 is—a basic smartphone VPN that provides a basic service that’s OK for day-to-day use. On the other hand, subscribing to NordVPN for 3 years gets you $2.99 per month, which is the same monthly price as VPN 360 but with way better features. Unless you’re really adamant about not paying for 3 years upfront, going with NordVPN is a much better deal. Signing up to VPN 360 is very simple. In fact, you don’t sign up, per se—instead, you just download the app and start using it. 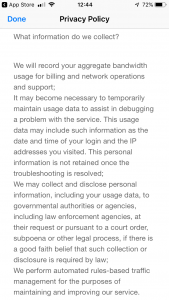 If you pay for a subscription, it is tied to your Google Account or Apple ID. This works in the same way as many other popular apps do. Again, this isn’t ideal for most privacy-conscious people. For the average day-to-day user, though, it is fine. As for one of the most important aspects of any VPN—the range of servers and locations on offer–we weren’t too impressed by the small range of locations VPN 360 users have to choose from. That’s all of them. 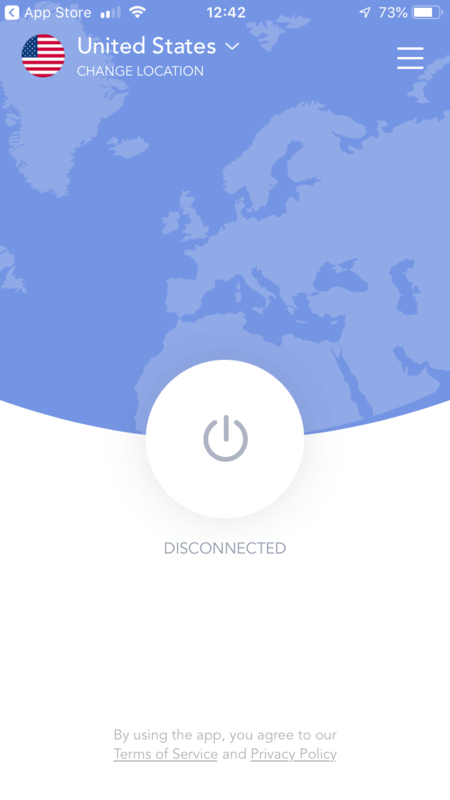 You have a choice between connecting to two servers based in the U.S. and one server each in the rest of the countries—Canada, Japan, Hong Kong, Singapore, Australia, Germany, France, and the Netherlands. This is hardly surprising considering how few servers VPN 360 has. The best VPNs for Netflix often give you fast servers optimized for streaming. VPN 360 just doesn’t have the variety. It is unclear what VPN 360’s torrenting policy is. In fact, they probably don’t have one—torrenting is not something you would be using a smartphone VPN for… or a smartphone. It’s an activity done using a computer and VPN 360 does not have a desktop app at this moment in time. If you still want to torrent, check out the best VPNs for torrenting. VPN 360 does not offer any refunds for their service. 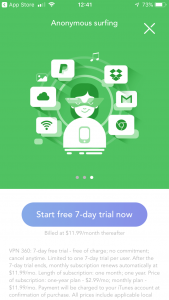 You can, however, take advantage of their 7-day free trial that lets you try out the premium version of VPN 360 without being billed. After the 7-day period has lapsed, you will be billed for their monthly plan if you don’t cancel. We think 7 days is more than enough time to get a feel for VPN 360 and whether or not you would like to subscribe to it properly. Remember, you’ll need to cancel the trial before the last 24 hours of your trial period. VPN 360 will auto-renew and charge you during that time. Since VPN 360 is only available through the Android Google Play Store or the Apple App Store, you can only pay for your subscription using the payment method(s) you use with these services. Typically, this will mean using your credit or debit card to make a payment. This isn’t great for people who are extremely privacy-conscious as it means your payment method can be tied to purchasing a VPN subscription. We don’t recommend this VPN for serious folk who need complete and unfettered privacy—more on why later. VPN 360 is available for both Android and iOS devices through their respective app stores. At the moment, there is no indication that Infinity Software will be releasing a desktop version of their VPN product. Although the app has a button for customer support (‘Need help?‘ in the hamburger menu), all this does is give you an email address that you can contact. They could have at least incorporated a contact form, but nope. Email support is a little bit outdated anyway and we like to see VPN providers offering something else. VPN 360 does not make it 100% clear which encryption method is being used for all their protocols. We do know that it is AES 256-bit encryption, the strongest and most secure encryption method, for the L2TP protocol. It is unclear which encryption method is used for IKEv2, though. 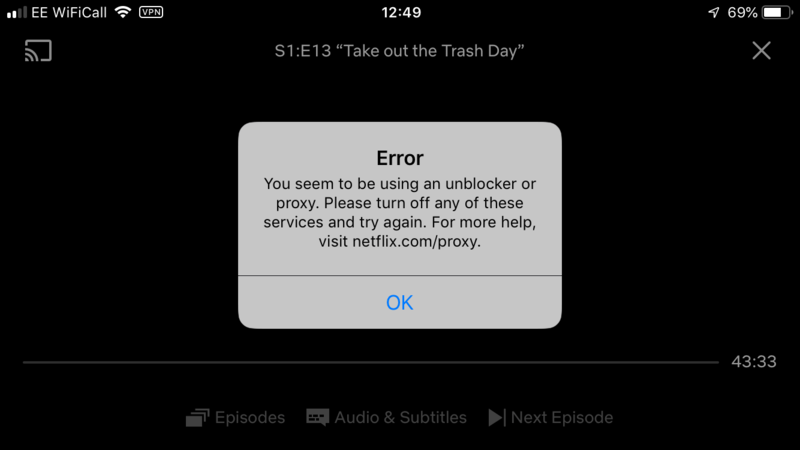 We were disappointed to learn that the OpenVPN tunneling protocol is not used as standard on their iOS app. This is the most secure tunneling protocol used by serious VPN services to provide the most secure connection possible. You can learn more about VPN protocols, what they are, and what each one means on our site, too. VPN 360 does not include a kill switch. This is an important tool that stops your IP address and other information being leaked if your VPN connection drops. A kill switch works by stepping in and blocking all internet traffic should this occur, and it is something that should be included as standard with any serious VPN. Unfortunately, this lack of kill switch loses VPN 360 a lot of points in our eyes. There is very little information available online about VPN 360. Their company website is nothing but a blank WordPress page. Hmm. According to sensortower.com, their revenues are at $500k. They also seem to be associated with TouchVPN, which is registered under AnchorFree, Inc., the company behind Hotspot Shield. This is quite a maze if you ask us. 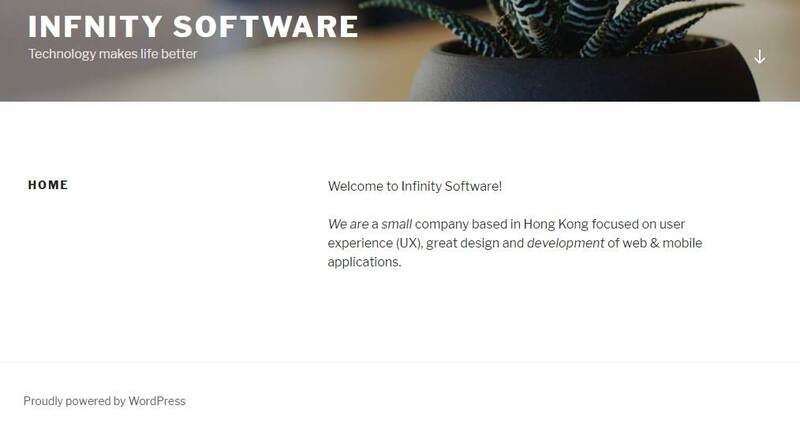 The publisher on the Apple App Store is listed as Infinity Software Co. Ltd and indeed VPN 360’s trademark is listed under this company. We believe that the company is legally registered and based in the U.S., a country subject to the scope of the 5-Eyes cross-border agreement for information and intelligence sharing. 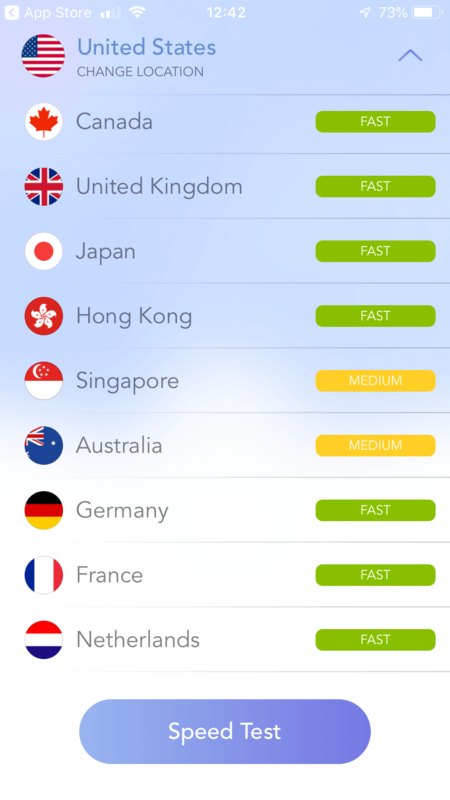 Although VPN 360 is relatively fast, has a very nice app, and is easy to use… we just cannot recommend it for serious use. The only good thing we can really say about VPN 360 is that it looks nice. It is not suitable for serious users or people who are concerned about their privacy. Who is it suitable for, then? Certainly not for serious people. Or anyone who wants to watch Netflix. Our advice? Head over to our top 10 list.